NOT from their parents. Surprised? I was. 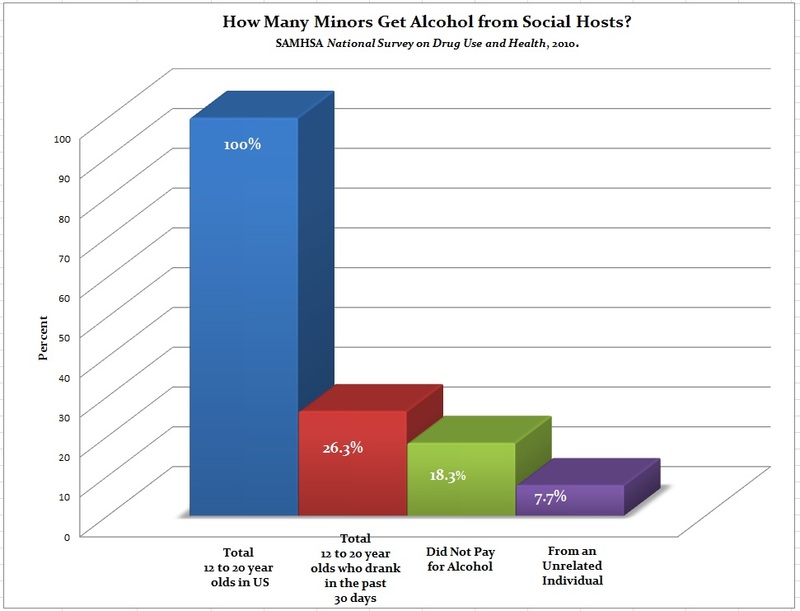 With all the furor about “permissive” parents providing alcohol to their older teens, I expected to learn that the majority of underage drinkers got alcohol from their parents or guardians. get alcohol from their parents or guardians. The Social Host Laws originally targeted parents who hosted parties with alcohol for minors, knowingly. Now, most versions of the law have taken a controversial step to broaden the definition of host to include adults who were clueless, i.e., out of the residence or asleep when the drinking occurred; or blameless, i.e., prohibited any underage alcohol use and were known to do so. Why did the laws change to include people we wouldn’t normally consider criminals? Because, most underage drinkers reported that their last use of alcohol in the past month occurred either in someone else’s home (55.3%) or their own home (29.9%)”. Included in those numbers were 7.0 percent of underage drinkers who “took the alcohol from home” or “took it from someone else’s home”. If a minor takes alcohol from your home without permission, it’s a toss-up whether they’re a thief or you’re a Social Host. Shall I wrap that or will you drink it here? Even though law enforcement and legislators have done an excellent job of preventing liquor stores, bars and restaurants from selling alcohol to minors, they haven’t done as well as we’ve hoped. According to the 2010 survey, nearly one-third of current alcohol users aged 12 to 20 (30.6%) paid for the last alcohol they used. That is a clear violation of Alcohol Beverage Control laws in all 50 states but not a Social Host Ordinance issue. Who are the Social Hosts in these statistics? We’ve excluded anyone who sells alcohol to minors because they’re straight-out criminals. And in 31 states, SHLs don’t cover religious ceremonies*, parents or guardians, and in many cases, other immediate family members. Who’s left? Unrelated individuals. They can be over or under 21, friends, strangers, cousins, college buddies, co-workers, fraternity brothers or sorority sisters, neighbors, teachers, anyone. Social Host Laws exist to prevent this amorphous list of people from providing, permitting, serving or harboring alcohol. In aggregate, they must be responsible for providing a lot of underage people a great volume of alcohol or else why are we creating these controversial new laws? Why, indeed? To quantify the need for Social Host legislation, we must start slicing the demographics even thinner. You can follow along or skip to the chart below. Among recent underage drinkers (26.3%) who drank free alcohol the last time they drank (69.4% of the 26.3%), fewer than half (42.4% of the sum of the previous equation) received it from an unrelated person. Since buying alcohol is still the number one way underage drinkers are getting their alcohol, we suggest policy-makers enforce the existing alcohol beverage control laws rather than make up new controversial legislation that penalizes parents. Let’s cut the alcohol supplied to minors by retailers, clubs and restaurants from over 30 percent to under 5 percent. Then, we can revisit the need for punishing parents. * Perhaps researchers can ask if the consumption was for religious purposes so we can remove that sector from the statistics. Or we could try this: lower the drinking age to something more in line with sociological reality. Kids first experience alcohol in their early teens and that’s true in any society where adults drink, no matter what the legal age. It was extremely irresponsible of lawmakers to criminalize the nation’s youth collectively. Did they really think young people would just fall in line with a repressive law against something that is both widely enjoyed and a symbol of adult status? Totally agree. Plus if you can go to the army at 18 why arnt you adult enough to drink.